A Florida stair lift or chairlift is a compact motorized chair that travels along a rail close to one side of the stairs. The rail is securely attached to a few stair treads but not the wall as commonly thought. Professional Installation takes only a few hours and your home is left as we found it. The chairlift is powered by two batteries which recharge automatically when not in use. The charger is similar in size to a laptop power supply and plugs into a regular 110v 15A outlet. At the top of the stairs the chair can be swiveled to face safely onto the top landing. The seat, arms and footrest fold up when not in use to keep your stairs clear for other stair users to pass easily. Weight limit: 350 lbs (straight stairs); 300 lbs (stairs that turn); upto 350 lbs (outdoor straight). Maximum: no maximum number of steps for models that go around corners. Minimum width: straight stairs - 26", stairs that turn - 29". Construction: wood, metal, stone, concrete. Carpeted treads are no problem. 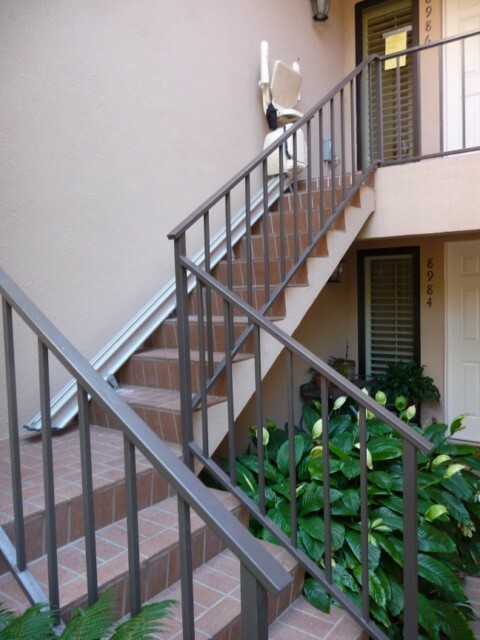 Doors at the top or bottom are usually OK.
Handrails usually get relocated but can often be left if desired. The outlet should ideally be within 15' of top or bottom of stairs, on the same side of the stairs as the stairlift. Most of our customers get a Florida Stairlift so they can stay in their own home. They can usually walk on flat ground but find stairs difficult. Wheelchair-users can use a stair lift as long they can transfer from one chair to another. 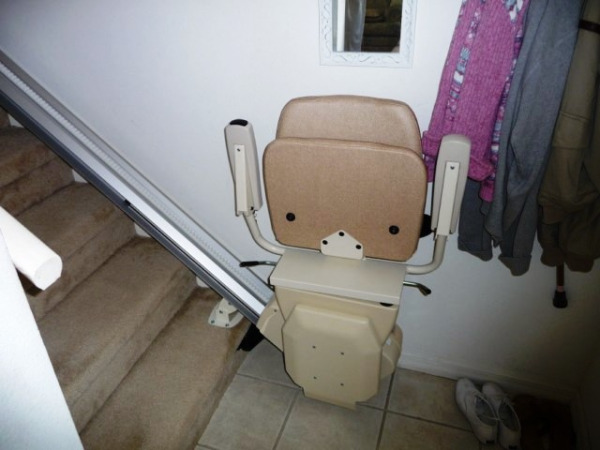 Many customers state they wish they had their stairlift installed years earlier. The user (or helper) pushes a button to make the chair go - it's designed for arthritic hands. A standard key switch is included and prevents unauthorized use. Family business with family members involved with designing, installing lifting equipment since 1985. As independent stairlift distributors we can supply the best lift to suit your needs, choose from many makes and models. We are proud of our customer service and customer satisfaction. Check out our references and BBB records. Coordinates with hospital and rehab center Discharge planners, Case Managers and therapists for safe, economical home modifications to maintain personal independence. Is a representative on the ASME A18.1 standards committee for the past 11 years, writing the American standards for stairlifts and vertical lifting platforms. Give back to the community through stairlift donations to worthy causes in Florida. We choose to sell only the safest and most reliable stairlifts on the market today. This is one of the reasons we offer MediTek Stairlifts and Stannah Stairlifts, the world's leading stairlift manufacturer. We sell our stair lifts including expert installation by our own experienced technicians. We have a reputation for good engineering and excellent customer-service. We have a stairlift suitable for almost everyone. Stairlift price depends on shape and length of stairs. For exact pricing call us at 1 888 605 0174 or email stairliftexpert@gmail.com , and we'll provide a FREE quotation and staircase survey for your specific needs.